Originating in the Eastern region of the Mediterranean, kale was cultivated as a food as early as 2000 B.C. Not only was kale cultivated as a food source, it was also considered to be medicinal. It was used for treating bowel conditions. As a vegetable, kale is a member of the cabbage family as well as the mustard family, kale is even a part of the Brussel sprout family. With its hearty crisp earthy flavor, it offers up plenty of flavor and nutrients. As a cruciferous vegetable, kale offers up plenty of delicious options and, since it is available in greens and purples, it also offers up some color in an otherwise boring meal. There are actually three main types of kale. 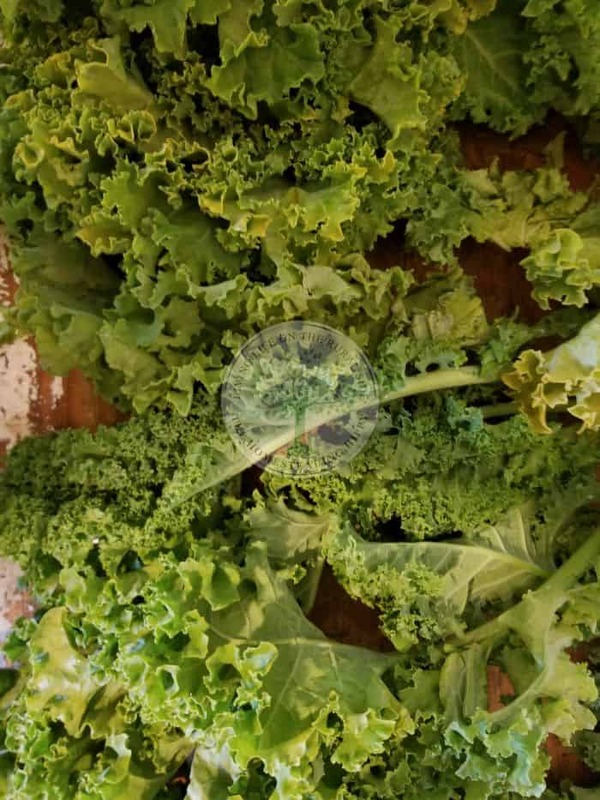 There is the most common variety of curly kale (also referred to as Scots kale), the curly green leaves are what you’ll find most often in the produce section of the grocery store. This type of kale is just fine for your kale chips and dehydrating. It’s also great in salads and other meals. They have a pretty green shade to them and the leaves are very curly or ruffly. The center stem is hard and fibrous. There is also the Lacinato or also called the dinosaur kale. This variety is a dark blue-green shade. It’s called dinosaur kale due to its scaly texture. It boasts longer flatter leaves that will remain very similar in texture after cooking. It’s not as bitter as its cousin the curly kale and is frequently used for making kale chips. It’s also an ideal addition to other meals and there is little taste difference other than the fact that this particular type of kale isn’t quite as bitter as the curly kale. Another favorite, is Red Russian Kale. This is a flat leaved variety that is very similar in shape to oak leaves. It boasts stalks that are slightly purple and the leaves of this particular variety have a reddish tinge. The stalks of this particular variety are fibrous and not typically eaten as frequently as they are rather chewy. It’s very similar to sorrel and boasts a hint of lemon and pepper. It’s still a great option for salads and sandwiches however, it’s most frequently used as a garnish or in juicing. It can also work for kale chips and to dehydrate if desired. Kale is a cool season vegetable that is most often grown in the cooler winter months. It’s an ideal addition when there aren’t as many fruits and vegetables available. Winter kale is ideally cooked as the sugars in winter vegetables can turn to starch which makes them bitterer and more fibrous. Kale doesn’t require a whole lot of garden care. You can plant it and allow it to grow just as you would any other form of cabbage, Brussel sprouts and lettuces that all do well in the cooler weather. Kale also contains 3 or more percent of the daily value of Vitamin B1 which is also called thiamin, Vitamin B2 or riboflavin, Vitamin B3 or niacin as well as phosphorus and iron. With a total caloric value of 33 and 6 grams of carbohydrates and 3 grams of protein, it’s perhaps one of the more perfect foods to include in your diet. Containing a large portion of Omega 3 fatty acids and little other fat, kale is rich in nutrients and low in calories which make it ideal for those who are watching their weight and still hungry. Kale’s valuable nutrients help to support healthy hair, skin, and bones. They promote a healthier lifestyle and will go far in helping to build strong bones, healthy skin and healthier hair. Kale is full of fiber that can aid in digestion and improve cardiovascular health. Statistics show that a diet high in fiber can do wonders for the cardiovascular system as well as the digestive system. Kale has more nutritional value than spinach. Kale can help to improve the blood and circulatory system. Kale may help to enhance blood glucose control in those who are struggling with diabetes. This may make it easier to manage a healthy diet and avoid too much sugar. Kale may lower the risk of some cancers. Kale may help to lower higher blood pressure. For those who are seeking a more natural way to reduce their blood pressure, a diet rich in kale may go far to aid them in this endeavor. Kale may help in the prevention and development of the breathing condition asthma. Kale is high in potassium which may help it to lower the risk of many heart conditions and disease. Kale is delicious when added to salads and smoothies and can greatly boost the nutritional value of such foods. Kale can aid in boosting well-being and the prevention of many health issues. Kale is full of antioxidants as well as calcium, Vitamin C and Vitamin K which can all aid in helping to boost the immune system. Kale has chlorophyll which may aid in many health conditions. Chlorophyll can aid the body in helping it to flush out toxins and it can help to improve the cardiovascular system. Kale is a rich source of iron which can help to prevent anemia. Iron also helps your blood cells to carry oxygen throughout your body. This helps to increase your red blood cells. Kale can help to improve the amount of minerals in a person’s body. Kale can aid in the development of healthy cells throughout the body. Kale has plenty of magnesium which is a vital mineral that many don’t get enough of. Magnesium may aid in the protection of diabetes type 2 as well as many heart conditions. Kale, unlike spinach, is low in oxolates. Oxolates can prevent the body from absorbing minerals that it needs to maintain health. Kale contains lutein which is excellent for eye health and the prevention of macular degeneration. Kale has isothiocyanates which can help to detoxify the body and prevent tumors. Pick or purchase fresh kale. Rinse your freshly picked or purchased kale well and gently pat the kale dry with a paper towel or clean towel. Prepare your baking sheet or your dehydrator trays to place the kale chips on. A baking sheet should be oiled with olive oil. Gently remove the leaves from the kale by holding the stem in one hand, and removing the leaves with your other hand. Toss out any yellowing or browning leaves and keep only the green or purple leaves. Once you’ve removed the leaves, you simply place them on either a baking sheet that’s been oiled with olive oil, or onto a dehydrating tray. Don’t overcrowd the kale. 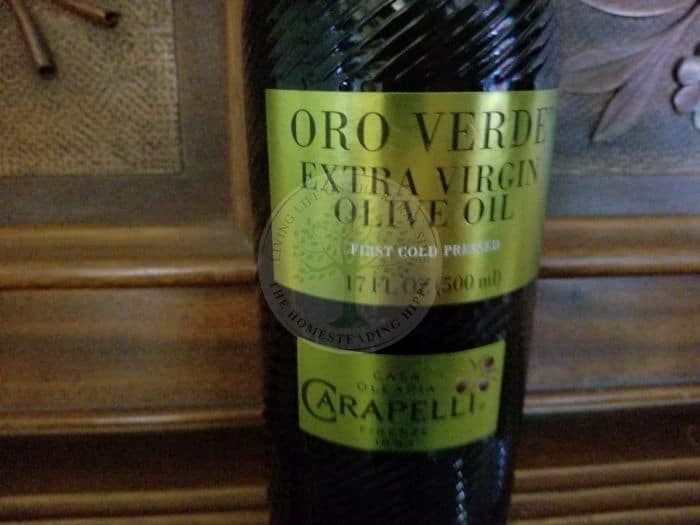 You want it to have plenty of olive oil on it and you want it to have plenty of room and not overlap. Sprinkle the top of your kale with more olive oil taking care that all of the kale has been gently brushed with the olive oil. You may wish to toss the kale lightly around on the pan or tray ensuring that it’s completely covered in the oil. 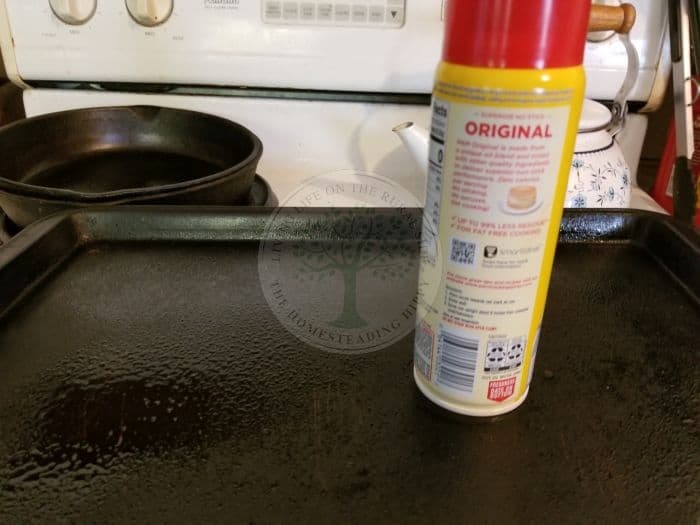 If you prefer, you can use a different type of oil just make sure that it’s a healthy oil and that you coat the leaves fairly evenly, the oil helps the leaves to crisp up and it helps to adhere the seasonings to the leaves when you’re crisping them. Season your kale with your favorite seasonings. 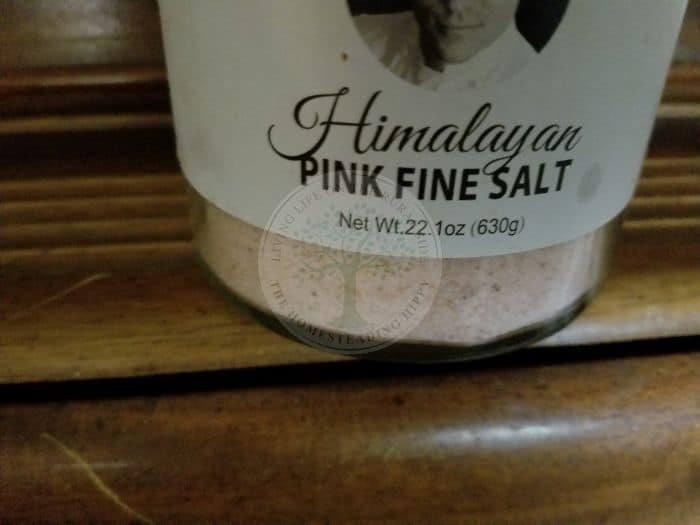 We like pink Himalayan sea salt, a pinch of garlic powder, onion powder, and a pinch of chili powder on our kale leaves, but you may prefer something different. (Other suggested seasonings: Lime or citrus peel that is ground fine, cayenne pepper, pepper flakes, garlic salt, basil, curry etc.). 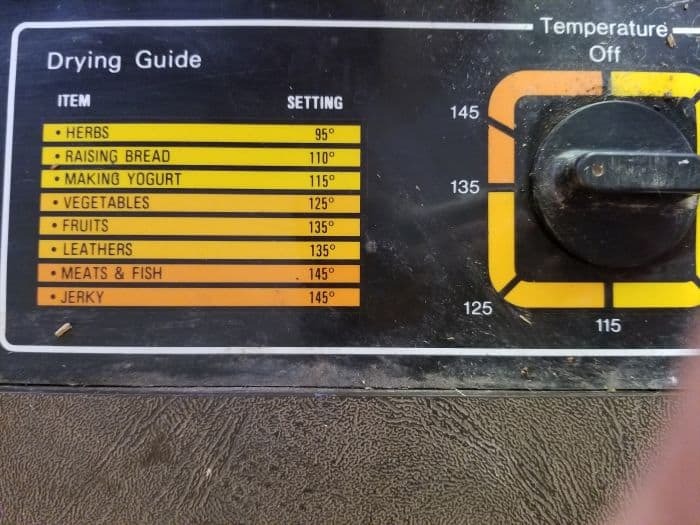 Set your oven to 275 degrees Fahrenheit, or your dehydrator to the vegetables setting (on my Excalibur dehydrator this is 125 degrees Fahrenheit but you may have a different style of dehydrator so follow your dehydrators instructions). 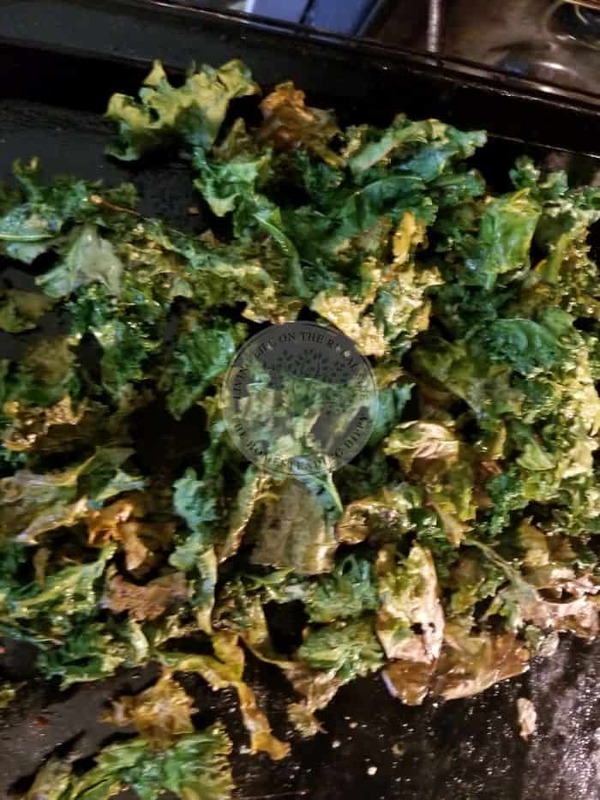 Place your kale baking sheet into the oven or into your dehydrator and allow the kale to crisp. It takes anywhere from 10 to 20 minutes in the oven. Turn the kale gently and allow it to completely crisp on both sides. Turn the oven off and allow it to sit until it’s all crisp. 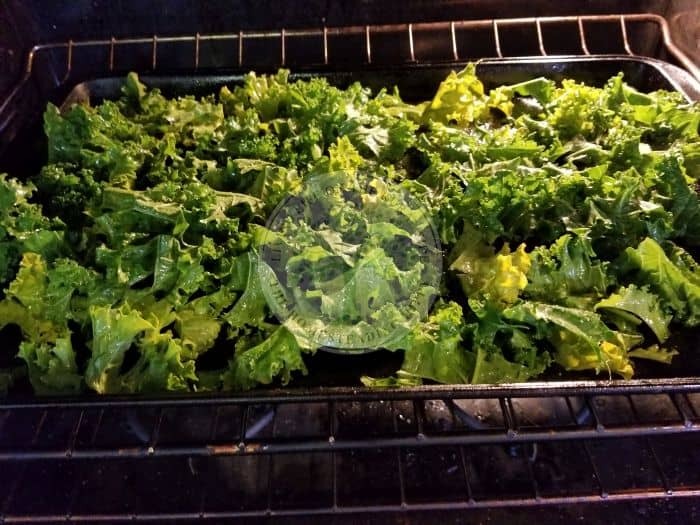 Oven temperatures often vary so use your best judgment and remember that it’s okay to leave your kale in the over longer or even for a lesser amount of time to achieve your desired amount of crispness. For dehydrators, check it after about 15 minutes. You won’t need to turn the kale in the dehydrator. My dehydrator, at the setting for Vegetables and 125 degrees Fahrenheit it took my kale about an hour to make crispy kale chips. Many people like the kale fresh out of the oven or dehydrator. Some people even like a fresh sprinkle of sea salt on the kale chips when they are removed from the oven or dehydrator. If you have leftover kale after making chips, you can store your crisp kale chips in a plastic container with a lid. 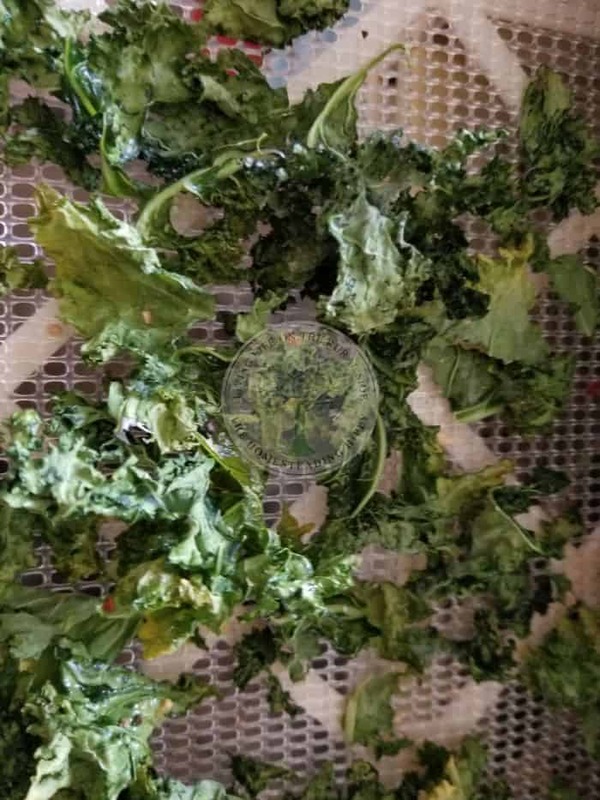 Kale chips are fragile and if you try to put them in a plastic zipper style bag they tend to crumble easily and become “kale dust”. However, if you’re trying to sneak some nutrition into a meal and the kids tell you that they don’t like kale, this is an ideal way to go about it. Most kids won’t even know you’ve snuck some kale dust into their meals if you do it like this. Kale chips are an excellent replacement for fat laden potato chips if you’re trying to lose weight. Kale offers a variety of health benefits in comparison to potato chips. If you’re trying to lose weight, try replacing fatty potato chips with kale chips and see if you ‘re not feeling healthier and losing some of that weight. Brown sausage, onion and garlic until sausage in a medium soup pan until the sausage is cooked through. While the sausage is browning with the onions and garlic, peel potatoes and dice into bite sized pieces. After the sausage, onion and garlic are browned add in the potatoes with just enough chicken stock (water or stock of your choice) to cover the potatoes and cook until the potatoes are cooked through and just tender. If your soup is too thick, you can add in more chicken stock (water or stock of your choice) to thin it down a bit. Toss in the kale and stir it into the soup gently. Add the butter to the top and allow the butter to melt while the kale simmers. If desired, you can add in about 2/3’s of a cup of milk to this. Sometimes, we will take out about a cup of the soup and mash the potatoes and return them to the soup to thicken the soup. It all depends on our mood at the time. Serve hot with some garlic toast and you have a healthy hearty meal that will satisfy even the hungriest of the crew. If you prefer, you can prepare the kale as above for chips and leave out the seasonings. Store dehydrated kale in a plastic container, a glass jar with a lid, or a plastic zippered bag and add to your meals to increase the nutritional value of your meals. It’s ideal when added to soups, stews, eggs, casseroles, sandwich spreads, fried potatoes, and anything else you can think of to add it to. Dehydrated kale won’t overpower your meals if you just sneak in smaller amounts such as ½ to 1 cup per above mentioned food item. Kale will greatly boost the nutritional value and help to nurture and improve the health. Add some dehydrated kale to your pizza sauce to add some great nutrition to your pizza. Raw Kale is also ideal to tear up and put raw into salads. You can use raw kale to replace lettuce on tacos or sandwiches. Serve kale steamed as you would steamed spinach for a delicious side dish. Saute kale with a bit of onion and bacon for a unique taste treat. Add some kale to soups as they simmer on your stove top or put some into a casserole. Kale is a delicious addition to a smoothie or if you’re juicing. Simply add a handful or two of kale to the rest of your ingredients for a delicious and nutrition taste treat. 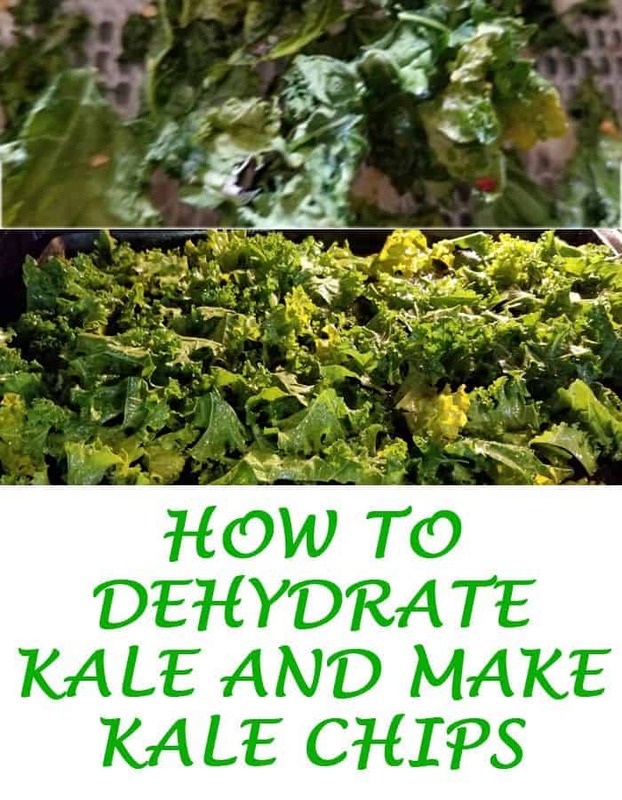 Dehydrated kale can also be added in lieu of fresh kale. As always, there are a few potential side effects of kale if you’re on certain medications or if you have specific medical conditions. Keep in mind that if you are on any medication, it’s always wise to check with your doctor or your pharmacist before you add kale to your diet. 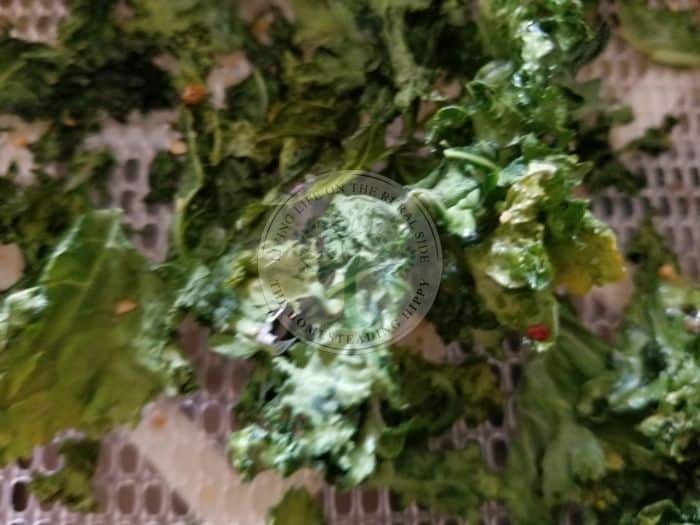 There are a few health risks of kale if you’re on beta blockers, for example, you’ll want to know that kale will increase the levels of potassium in the blood. Foods that are high in potassium should only be eaten in moderation if you’re taking any beta blockers. If you have a kidney condition too much potassium may be harmful as well. Many kidney conditions mean that the body can’t remove excess potassium from the body and this could lead to a fatal overload of potassium. Eating kale may increase the levels of potassium in such individuals so be sure to check with your doctor first if you have any kind of a kidney condition. Thanks to the large amount of Vitamin K in kale, which offers 1,062.1 mcg of Vitamin K per serving of kale. Kale can aid in the clotting of blood. People who are on blood thinners like Warfarin or even Coumadin, shouldn’t eat kale without first discussing the potential risks with their doctor or pharmacist. If you’re feeling stomach upset or digestive issues after eating kale, you may be eating too much of a good thing at a time. Try eating less fresh kale or adding less dehydrated kale into your foods, smoothies or juices and see if you’re not feeling better. Kale is a perfect food and different countries enjoy kale served differently. Keep in mind that these are just a few examples of how other countries and regions enjoy Kale. There are many other great ways to enjoy kale out there. North America: Kale is often served as chips, steamed, braised, and fresh in salads. South America: Brazil uses Kale in a side dish that is a type of a stew called feijoada. Africa: Boiled and served with coconut milk. It may also be served with ground peanuts, in cornmeal, and in rice dishes. Europe: Many Europeans enjoy a traditional New Years Danish that boasts boiled ham, glazed potatoes and a healthy serving of stewed kale. Netherlands: Often served with a smoked sausage and mashed potatoes with fried bacon and kale is boerenkoolstamppot. Italy: Kale is often included in Tuscan foods and soups. Italy is famous for many things and their soups are often full of nutritious vegetables including kale. Many an Italian soup has kale floating in the delicious broth. Denmark and Southwest Sweden: Kale is often served with ham at Christmas in these regions. Scotland: Kale is frequently served in Scotland in a variety of ways. They have a term that if one is “off one’s kail” one is feeling too sick to eat. Asia: Kale is frequently served in a variety of dishes in China, Vietnam, Taiwan and South Korea. It’s frequently used in juices and called “green juice”. It’s a nice addition to stir fry’s as well as to other Asian dishes. It’s frequently added into meals in its dehydrated form to boost nutrition and flavor. Kale is perhaps one of the most perfect foods. It’s low in calories, high in minerals and vitamins, and it offers plenty of fiber to the diet. It’s a delicious addition to many meals and there are endless ways to enjoy kale from kale chips, dehydrated kale and fresh kale. If you’re looking for a perfect heart healthy food, you may wish to consider adding kale to your next meal. If you’re not currently growing kale in your personal family garden, you can often find kale at Farmer’s markets, in organic grocery stores, in regular grocery stores, and in your neighbors’ garden. In our area, some of the homesteads tend to do better for some vegetables over others, so we often trade produce and each homestead grows produce that does very well in their particular garden. We then trade the produce back and forth so that each homestead has plenty of fresh produce during the fall season.